The century plant, or Agave americana has its origin in the wild desert areas of Central America and particularly in Mexico. Agave americana is now grown as an ornamental plant in tropical and subtropical regions worldwide. This species comprises large plants having wobbly and open rosettes without trunks. Century plant bears long leaves growing up to 6 feet (2 meters) in length and having a grey-green hue. The leaves are about 10 inches (25 cm) in width having hooked spikes on the periphery. Even the leaf tips have an extremely pointed spine that may be about 2 inches (5 cm) in length. The flowers are pale yellow and pollinated by butterflies and bats. In the tropics agave americana flowers after 10 to 15 years and in colder climates it can take up to 50 years to bloom. The flower stalk, which is 20 to 40 feet tall, is branched and bears big yellowish-green flowers that are three to four inches in diameter. The most preferred cultivars of this species include ‘Marginata', which bears leaves with yellow margins, ‘Mediopicta' having wide yellowish band down the middle of every leaf, and ‘Striata', having striped leaves. Leaves in the multi-colored variations have a white or yellow stripe at the periphery or in the middle. When the leaves of century plant open up from the middle of the rosette, the mark of the peripheral spikes becomes noticeable on the tender leaves which are still straight. The leaves end in a long, sharply pointed blade tip that can be 3 inches long. The up to 3 meters-long inflorescence has horizontal branches and sits on top of a 6 to 12 meter high stem. Blue Agave americana, a variety of the century plant, is found growing in plenty in the Karoo as well as the dry upland areas of South Africa. This species was actually introduced by the British settlers in these regions way back in 1820 and was initially grown as well as utilized as a crisis food for livestock. Presently, the plant is cultivated and mainly used to produce sugar and syrup. 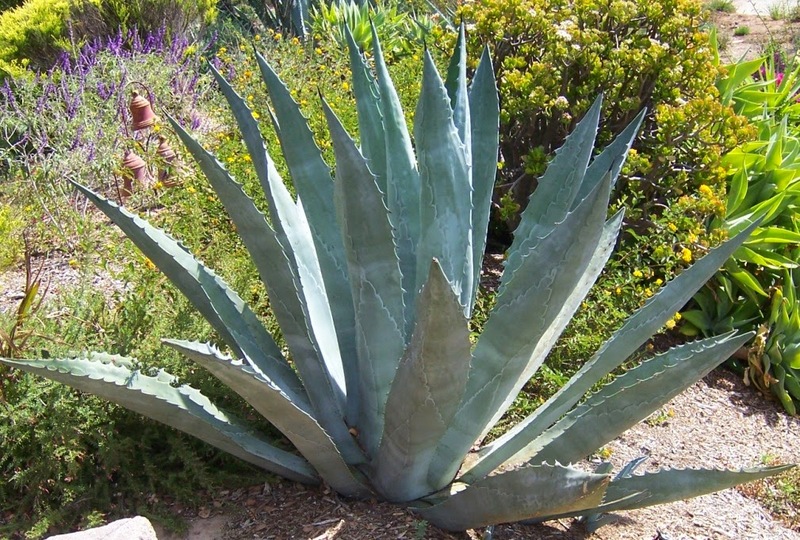 Century Plant (Agave Americana) yields a sap that is employed medicinally as a laxative and a diuretic. Century plant was used as an herbal remedy for weak digestion, intestinal gas and constipation. The juice has antibacterial properties and can be used internally to control the growth of decay bacteria in the stomach and intestines. 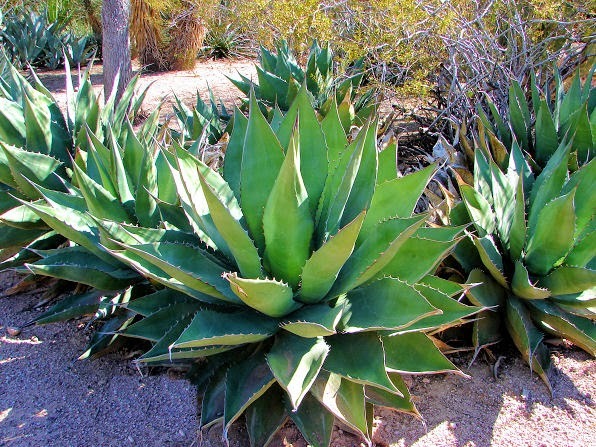 Although agave seems like a laxative, the herb can also be used as a treatment for diarrhea and dysentery. Precursors of steroid hormones are also derived from the century plant leaves. Century plant has antiseptic, wound-healing and anti-inflammatory properties, which explain its uses externally as a medicinal herb to treat burns, bruises, minor cuts, injuries and skin irritation caused by insect bites. In Central America the juice from the agave plant has, for a long time, been used as a treatment for wounds. The Aztecs and Mayans used agave juice and egg whites to make a poultice that was then laid on wounds to speed healing. Traditionally, it was used internally to treat ulcers, stomach inflammation, tuberculosis, jaundice and other liver diseases, syphilis and menstrual problems. Additionally it is used as a treatment for high fever by inducing sweat. Apart from its use for medicinal purposes, the flower stalk as well as the heart of century plant possess a sweet flavor and can be eaten after roasting them. The seeds of this plant are pulverized to produce a type of flour which is used to make bread. In addition, the seed powder is also used as a thickener while preparing soups. When the flowering stem of century plant is cut before it bears flowers, it yields a sweet liquid known as agua miel, also known as ‘honey water'. This liquid collects in the heart of the century plant and can be fermented to make a drink known as ‘pulque'. The juice made from the agave plant contains estrogen-like isoflavonoid, alkaloids, coumarin and vitamins B1, B2, C, D and K, and provitamin A. In Mexico as well as Central America people often use the century plant as fencing. The dense hedgerow formed by the plants having long spiky succulent leaves is really impervious to people as well as cattle. Many people use the century plants as ornamental plants and often grow them on rock gardens, in boundaries, in the Mediterranean-style topography, in succulent and cactus gardens as well as a sampling. Pregnant women should not use Century Plant internally. Large quantities of the herb can irritate the digestive system and even cause liver damage. The century Plant can trigger allergic reaction in some people and cause irritation and rashes.